The global warming political agenda is still alive. President Obama reminded us all of this with his recent condemnation of the "Koch brothers" and his call for clean and renewable energy. 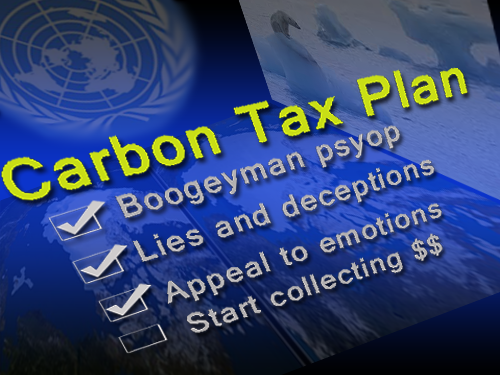 But we need to take a close look at the layers of deception in this latest psyop march to a global carbon tax in the name of global warming. We all know that the global warming lie first disguised itself under the name 'climate change'. Now we are seeing the same lie hiding itself further under several other new terms and buzz words. Each term is conveniently more and more generally acceptable and difficult to deny. After all, who doesn't want clean energy or renewable energy? We all do, but how many people are asking, what does that have to do with the original false claim that CO2 is the cause of a catastrophically warming planet? And who wants to side with the pro-fossil fuel burning Koch brothers on anything? It just feels right to side against the vilified Koch brothers. They are the perfect villains to play the role of common enemy in order to unify the global warming activists. This is why propping up the Koch brothers as the poster "deniers" or anti-global warming, pro-fossil fuel patsies of the movement is the perfect psyop. And this latest global warming psyop which utilizes key words and names to invoke specific reactions is important to understand in order to see where all of this is going. The fact is that the global warming lie is otherwise on artificial life support and only exists in the minds and the lips of the controllers pushing us toward global enslavement and global carbon tax. Consider that to this day Al Gore himself won't debate the global warming issue or defend the issue against the "deniers" of the world, the independent scientists and scholars not with IPCC. They would rather throw an event or a concert to reiterate their lies to each other in a non-confrontational setting. We are living in a day and age of pure deception. Almost every single piece of news pushed by the corporate mainstream media can be taken for a sure lie. It's the era of political wide open corrupt agendas. And those appointed as mouthpieces, the corrupt politicians, no longer care how wrong they are. They don't even care how exposed they are because they seem to operate in their own mental and physical security zone which they feel protects them from the ramifications of reality. The politician mouthpieces no longer feel an obligation to tell the truth and they feel completely immune to the consequences of lying. One question we should all be asking is can we expect lies that are drawn out over decades and rolled out in slow motion to be successful? Can these lies truly survive the test of time in today's information age? We don't know how these lies will drive the course of humanity but the world is about to find out as the controllers have banked on this top-down force-feeding of their lies on the masses, even in the face of science that proves them wrong. This is the nature of the course the global warming movement has taken over the years. The movement has been shrouded in lies and deceit. We've watched over the last few decades as the movement evolved into a stubborn religion. And like a cult or religion it is now completely immune to logic, reason, facts, or even modern day easily documented historical accounts that completely debunk the movement. The global warming dogma now threatens humanity and the main goal of the controllers is to use the ideology as a tool to permanently enslave the species. As we move closer to a major U.N. Climate event starting on November 30th 2015 in Paris France, we now are being fed a constant diet of sound bites, headlines and speeches from our political leaders. In this recent headline Obama openly criticizes the "Koch brothers" for opposing renewable energy in favor of fossil fuel energy. This is a reminder to all that this tactic works because Americans in particular often NEED a boogeyman to point to in order to justify their belief or support of something. And no single tactic has worked more effectively to fool the global warming believers in lieu of actual facts to prove their argument. I've stated many times that one of the reasons we now live in a profoundly confused Orwellian society is because unfortunately humans by their very nature are easy to fool. That's right. This propensity for easily being fooled is one huge flaw in humanity that was made even worse with the rise of technology and political corruption over the past century. The Koch brothers ad hominem logic stated above allows the average global warming sheeple to bypass the logic section of their brain that should be asking for proof that CO2 drives global temperature and not the other way around. The logic section of the brain that should be asking how can a greenhouse gas that represents LESS than .1 percent of all atmospheric greenhouse gases be the dominant factor determining global temperatures, is apparently completely shut. The Koch brothers ad hominem logic replaces any logic that might creep in asking things like- what about the all mighty sun and the powerful solar energy heating rays it beams down on the earth and all the planets around it? Shouldn't this account more for the planets heat source than a microscopic gas? The difference is that asking logical scientific questions and doing your own research about the sun, global temperature determinants and CO2 are all functions of the logic (left brain, critical thinking) section of your brain. Getting worked up about the "Koch brothers" and using this as the single definitive proof that since they oppose climate change measures then global warming must be real, is a thought process driven by primitive functions of instinct (lower brain) and emotion (limbic system). No logic required! This is exactly what it was all about to pioneers of propaganda like Edward Bernays. He said it many times. To control public opinion and the minds of the masses you had to appeal to primitive instincts and emotions NOT to logic and reason or (god forbid) ethics and morality of truth. And so here we are in 2015 on the eve of a major push for a global carbon tax which the controllers have been planning for a long time now and the "Koch brothers" psyop (as I call it) rolls right along as a major emotional and instinctual driving force behind the deceptive global warming turned climate change religion which completely ignores that climate change is very real only it's because of the global ongoing geoengineering chemtrails and chembomb spraying programs. So without reiterating the profound ignorance and arrogance of the so-called climate change movement of ignoring geoengineering as the only realistic cause of climate change, let's keep in mind that this is about mind control. Make no mistake. Those that believe the global warming lies usually mean well. They are victims themselves to the propaganda. They really do connect with the idea that if perceived bad guys are opposing their efforts, this is more reason to feel inspired. And it gives them a stronger sense of morality and purpose to fight for, the same way that religious people with strong well intended convictions will stand strong in their beliefs. Many of us have spoken with and observed the climate change movement in action and we are familiar with the climate morality wrapped in layers of ignorance and it is up to us to find ways to wake them up. With every mention of the Koch brothers it is up to those awakened to the truth of this long term nefarious climate agenda to find ways to break down this narrative and bring the conversation BACK to simple science and reason if possible. Remind them also that the Koch brothers are indeed part of this psyop by design and they themselves have funded the global warming movement in the past. The Koch brothers psyops is no different than the ISIS psyop or any other staged boogeyman psyops played out by the controllers. As always, the patsies are always playing both sides. Learn the script now if you haven't got it down yet. Let's all get on the same page with this most important global psyop so we can effectively confront their lies at the local levels and abroad. Yes, we all want renewable energy and a clean earth. That's a given. Who doesn't want that? What is not true is that the need for a clean earth and renewable energy somehow confirms that CO2 or even more so human produced CO2 is the cause of climate change. Don't think this is an important topic? Remember it's YOUR freedom that is going to be debated this November in Paris as the globalist try to cement their global climate religion so they can eventually implement Agenda 21 globally and tax every human for living and breathing. This is without question their ace in the hole agenda for global enslavement. Stay on top of it and don't be caught looking the other way if and when it gets implemented. Do your part to counter the anti-logic and denial the climate religion is deeply wrapped in. Meditate and pray for wisdom when dealing with the zombies that push this religion. Try to keep your cool and composure when dealing with this psyop cult. Above all, realize deep inside your heart and mind, that this is a religion. Do your research on how to deal with the religious mind and use every bit of skill you can think of. Realize that this is really a special issue with a special group of people who are especially brainwashed in a topic that is especially important to them in the same way that religious rules are to devout religious people. Understandably so since climate in general is an important issue. Are you getting the full picture of the challenge we have in front of us? Support educational efforts to expose the original global warming lies. The track record and history of the failures of the global warming movement is on record and undeniable. Finally, let's be thankful for the widespread opposition and criticism the global warming movement has received and let's hope and strategize for new ways to maintain this strong opposition and more importantly the global awareness of this opposition. I believe nature will take care of the rest and we're already seeing this. Let's be patient and watch as the movement shrinks as more and more people start to think on their own. Let's not worry too much about those who still don't get it. Our efforts are much better spent on creating solutions to combat global dictatorship by spreading knowledge, empowering local communities and individuals to resist top-down control and developing local peer to peer solutions that will make all of the global rulers obsolete.